The FDA just issued one of the largest and most serious consumer alerts about over-the-counter supplements being sold for weight loss. Twenty five products were found to be tainted with active pharmaceutical ingredients that may put people’s health at significant risk. 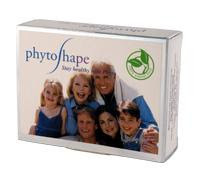 According to the press release, the FDA found prescription drugs in these dietary supplements, some at levels that far exceeeded their maximum recommended dosages. And the undeclared pharmaceuticals its analysis found are especially concerning. They include: sibutramine (a controlled substance), rimonabant (a drug not approved for marketing in the United States), phenytoin (an anti-seizure medication), and phenolphthalein (a solution used in chemical experiments and a suspected cancer causing agent [follow link to FDA Consumer Advisory]). Some of the products claim to be “natural” or to contain only “herbal” ingredients, but actually contain potentially harmful ingredients not listed on the product labels or in promotional advertisements. These products have not been approved by the FDA, are illegal and may be potentially harmful to unsuspecting consumers. The FDA advises consumers who have used any of these products to stop taking them and consult their healthcare professional immediately. The health risks posed by these products can be serious; for example, sibutramine, which was found in many of the products, can cause high blood pressure, seizures, tachycardia, palpitations, heart attack or stroke. This drug can also interact with other medications that patients may be taking and increase their risks for adverse drug events. The safety of sibutramine has also not been established in pregnant and lactating women, or in children younger than 16 years of age. 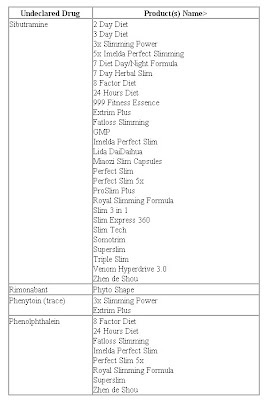 Rimonabant was another ingredient found in these products, and had been evaluated, but not approved by the FDA for marketing in the United States. The drug, which was approved in Europe, has been associated with increased risk of depression and suicidal thoughts and has been linked to five deaths and 720 adverse reactions in Europe over the last two years. Sibutramine. Some of the identified products recommend taking more than 3 times the recommended daily dosage of sibutramine. Because of this, even consumers without a history of health problems that take these high doses of sibutramine may suffer serious adverse effects if they take these products, such as increased blood pressure, tachycardia, palpitations, and seizure. ● Patients with a history of hypertension, especially those with uncontrolled or poorly controlled hypertension. ● Patients with a history of coronary artery disease, congestive heart failure, arrhythmias, or stroke. ● Patients with narrow angle glaucoma. ● Patients with a history of seizure. ● Patients predisposed to bleeding events and those taking concomitant medications known to affect hemostasis or platelet function. ● Patients with severe hepatic dysfunction. Rimonabant. Rimonabant is the active pharmaceutical ingredient in Zimulti which has not been approved in the United States. In Europe the drug is known as Acomplia. In June 2007, the FDA Endocrinologic and Metabolic Drugs Advisory Committee unanimously voted not to recommend approval of the drug because of increased risk of neurological and psychiatric side effects—seizures, depression, anxiety, insomnia, aggressiveness, and suicidal thoughts among patients. In June of 2008, the Medicines and Healthcare Products Regulatory Agency of the United Kingdom linked rimonabant to 5 deaths and 720 adverse reactions over the past two years. In October, the European Medicines Agency recommended that marketing and sales of Accomplia be suspended due to safety concerns. Phenolphthalein. Phenolphthalein was an ingredient in some Over-the-Counter laxative products until 1999 when the FDA reclassified the drug as “not generally recognized as safe and effective” after studies indicated that phenolphthalein presented a potential carcinogenic risk. Phenolphthalein has also been found to be genotoxic in that it can damage or cause mutations to DNA. There is no such thing as a safe and effective diet pill. Please see major UPDATE on January 10, 2009 here.